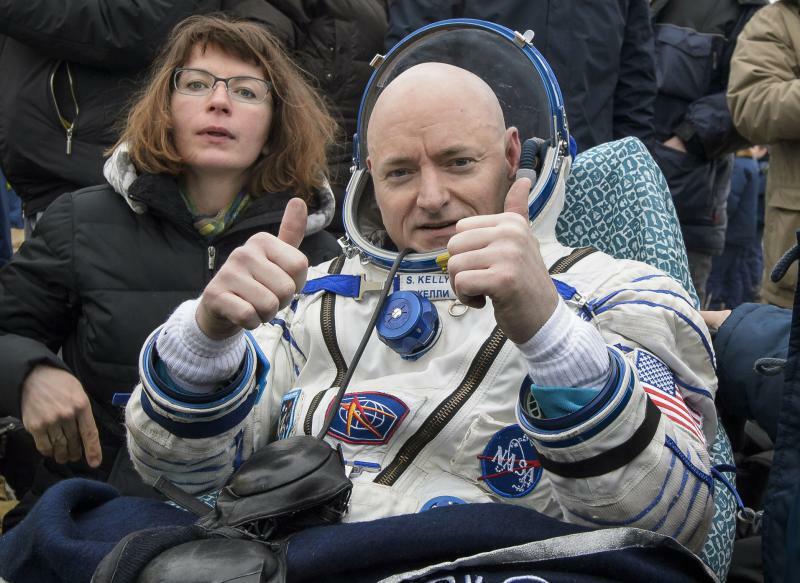 International Space Station (ISS) crew member Scott Kelly of the U.S. reacts after landing near the town of Dzhezkazgan, Kazakhstan. We’re revisiting our conversation with astronaut Scott Kelly — and other favorites — as part of Two Way Street’s birthday celebration. To mark our four years on the air, we’re listening back to the shows that have stuck with us the most. And it was an easy decision to include this one — because Kelly is one of only two people who can say they’ve spent a year in space. They began at the very beginning of Scott’s year in space: with what he packed in his bag that helped set the tone of his entire journey. His record-breaking time in space was the culmination of decades of preparation. He and his twin brother, Mark, began their careers as Navy test pilots. Then, in 1996, they got news that would change their lives forever: they’d been accepted into NASA’s astronaut program. Both men have since piloted missions to space — but it was their separation, with Mark on Earth and Scott in space, that made headlines. While Scott was orbiting Earth, Mark was below participating in NASA’s first-ever twin study for astronauts. The idea was to compare space’s effect on Scott against his own personal control group: Homebound Mark. That study measured mental and physical health, which is fitting because, as Scott reveals in this interview, all that time in space could be trying. You’ll hear about the challenges of long-term spaceflight, including the frustration of completing everyday tasks in zero gravity — and what it’s like to be over 200 miles from Earth when your family needs you most. That was the case when his sister-in-law, congresswoman Gabrielle Giffords was nearly shot dead in 2011. Later in the show, Scott tells us what it was like to receive that dark news in space.